Some recipes are so simple they're almost embarrassing to post. That's how I feel about this recipe for Smoked Sausage with Apples & Onions. I did say almost embarrassing, so I'm going to go ahead and post it. It's funny how sometimes the simplest of recipes turn out to be the best. That's how I feel about this dish. This is my youngest sons absolute favorite recipe, so I make it at least once a month. A couple weeks back I shared a recipe for a apple cider pound cake on my face book page. That particular recipe sparked a conversation on cooking and baking with apple cider. I mentioned how I love cook and bake with apple juice or cider. I received so many comments with the same question........ how do you cook with apple cider? I went on to explain how I use apple juice or cider in my Fall Off The Bone Ribs recipe and when I bake smoked sausage. Several people immediately wanted the recipe. Well I didn't have one to share, because it isn't much of a recipe at all. Just something I tossed together one night with ingredient that I had on hand. Who would of thought that this recipe would become part of our regular dinner rotation. I usually serve this with Skillet Potatoes or baked sweet potatoes and a vegetable. So without further ado here's the recipe. 1 - small onion, cut into chunks. Preheat oven to 350 degrees. Cut apples into 4 inch size pieces (or thickly slice). Add to a 8 x 8 or similar size baking dish. Add apples and onions, and sprinkle brown sugar over all the sausage. Add 1/2 cup apple juice or apple cider and cover the baking dish. Bake covered for 20 minutes. Remove lid and turn the sausage to coat. Continue baking un- covered for an additional 5 -7 minutes. Remove from oven and cool slightly before serving. Cooks Note: Pineapple chunks can also be substituted for apples. If using pineapple chunks drain the juice and use in place of the apple juice or cider. I so agree; the simplest recipes are the best. I must say, sometimes when I feel extremely tired or just plain lazy, I much rather make a quick and easy meal and this looks absolutely fantastic. Something much better and different than putting the sausage in a pan of water and heat it up. Colleen the apple juice with the brown sugar gives the sausage such a nice light glaze. And the onions give the sausage a great flavor. It really does not get more comforting and delicious than this meal. and 2/3 teaspoons of water. I'll be sure to comeback to tell you all how much was devoured. I was running low on butter - changed recipe to mixing four sausages in a bowl added olive oil, cut 2 small onions in small chunks, cut a turnip in small chunks, cut 2 red apples in small chunks - mix thoroughly place in a pan in preheated oven at 350 degrees for 30 minutes turning and stirring occasionally, opened a can of cranberry sauce too for a side kick, it tasted fantastic thank you for the inspiration for an tasty dinner. This recipe never had butter in it or any grease or oil added. 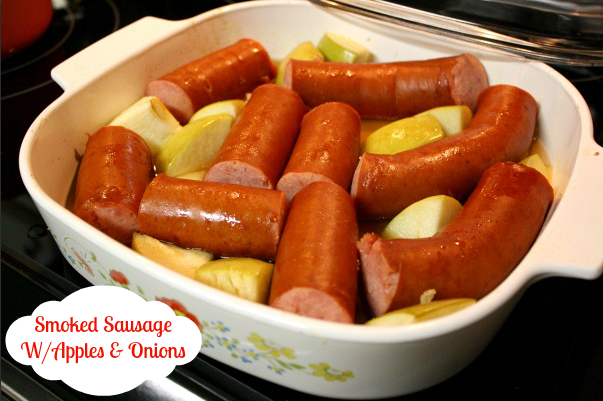 Just sausage, brown sugar, onions, apples and apple juice or cider. Thank you for this recipe! We bought 1/2 hog this year and I've been trying to find ways to cook all the meat. I took your suggestion about pineapple and used 2 cans with 1 can's worth of juice. Also used 2 ham steaks instead of the sausage. The only review worth mentioning is that when my husband saw me preparing it, he muttered something under his breath about getting take-out. He later apologized and said it was really good! I'll be keeping this recipe around and will try with apples in the fall! Hi Tina. I ran across this dish while meal planning and want to ask before i add it to my list. Do you eat the apples and onions as a side or are they just for flavor? If the apples are not too mushy after cooking I usually add a few to my plate. They are for flavor and not a side, but I love apples and onions.